All women can use a hand when it comes to filling their closets with the clothes that best flatter their figures, so these top 5 women's fashion tips can help you do just that. Knowing just what to wear could potentially save you money, and it will definitely help you look and feel your best. Finding clothing that fits well is always important. Beyond choosing clothing that works well for your particular shape and coloring, these universal tips can help any woman have only the most wearable items in her wardrobe. You don't necessarily need to adhere to every single one, but following even one or two can make a big difference. Save on the basics: Certain items don't require hefty spending. Basic tank tops, T-shirts and shorts, for example, are available for very reasonable, low prices at stores like Walmart and Old Navy. There's simply no reason to blow your budget on these everyday essentials. In fact, since you tend to wear these pieces regularly, spending less on them at a store means you can buy more of them in one go. If you happen to find a tank top you love at a low price, you can purchase several colors without suffering buyer's remorse. Now that's a stylish endeavor! 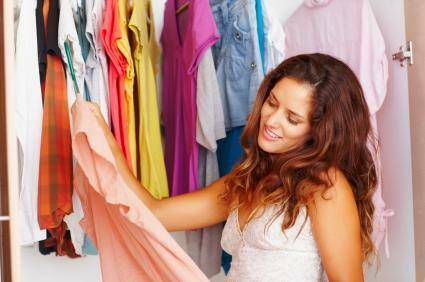 Clean your closet: This is one tip almost all women can benefit from at some point or another. Lose the clothes that you never, ever wear. This includes anything that is completely outdated, doesn't flatter your figure, is a leftover trend that you'd soon rather forget or hasn't seen the light of day in years. Maximize their potential, though, by donating them to a worthy charity. Build the classics: There are no items worth more in the long run than the classics in your wardrobe. They include a little black dress, a crisp white shirt, a blazer, a pair of flattering jeans, black pants, a smart wool coat, a neutral cardigan and a wrap dress. These are the pieces you can comfortably spend a bit more on. In other words, don't resist a slightly more costly winter coat if it fits you beautifully - it's something you'll likely wear for years. Trend lightly: Every season brings with it its fair share of trends. Recent seasons have seen everything from tops with sculptured shoulders and gladiator heels to sequins and studs. At some point or another, everything will come back into play again - but don't go overboard on your trend spends. Ideally, the bulk of your outfit should be composed of classics and accented by a trendy piece. For example, use a sequined scarf to add pizazz to a basic blazer and denim combo. Play up your assets: Whether you have strong, toned arms, great cleavage, killer legs or an hourglass figure, play up your best feature with clothes that really suit your shape. While this is right in line with wearing clothes that fit, it goes a step beyond that to include clothes that do more than just that. Truly flattering clothes will draw attention to your best features while downplaying trouble spots. Don't be afraid to show off what you've got! In the ever-changing world of fashion, rules seem so passé and, indeed, something to be ignored. On the other hand, rules shouldn't be seen as such when it comes to dressing your best. Basic dos and don'ts of fashion apply to men and women, and should be taken into account when purchasing new garments and building a working wardrobe that really goes the extra mile to make a woman feel her most confident. After all, that's the key when it comes to purchasing new clothes - they should look good on an individual's figure, not overpower her or, essentially, wear her instead of the other way around. From the most basic, everyday duds to professional attire, clothes that fit and work well in a woman's wardrobe are just a basic part of a woman's repertoire.